"Halt! Who goes there ?" 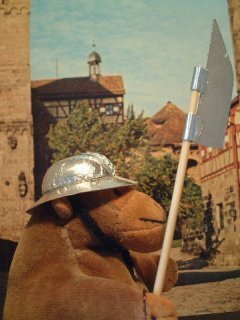 Mr Monkey claps on his kettle hat and picks up his voulge whenever he has to defend a medieval town and needs to pretend he's just a common soldier. 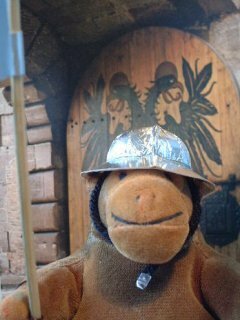 Mr Monkey's kettle hat is part of a Kinder Surprise egg covered in silver foil, with a brim made from silver card and a thick thread strap. His voulge is a bamboo skewer with a blade from silver card.